We had a busy, busy weekend full of Halloween parties and I made these scrum-delicious peanut butter chocolate chip cookie bars to take to one Saturday evening. These babies are fantastic-you can’t go wrong with this amazing recipe, I hope you enjoy it! 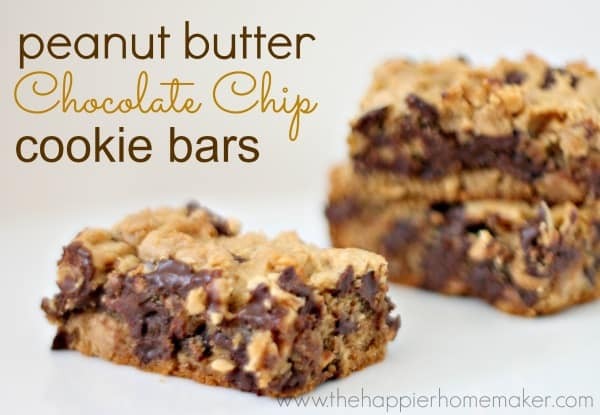 Delicious combination of peanut butter and chocolate in a moist cookie bar! Grease 9 by 13 baking pan. Whisk together flour, salt, and baking soda in a bowl, set aside. In a stand mixer mix brown sugar, peanut butter, butter and sugar until smooth. Add in egg and vanilla extract and mix on medium speed until just combined. Reduce mixer speed to low and add in flour mixture. 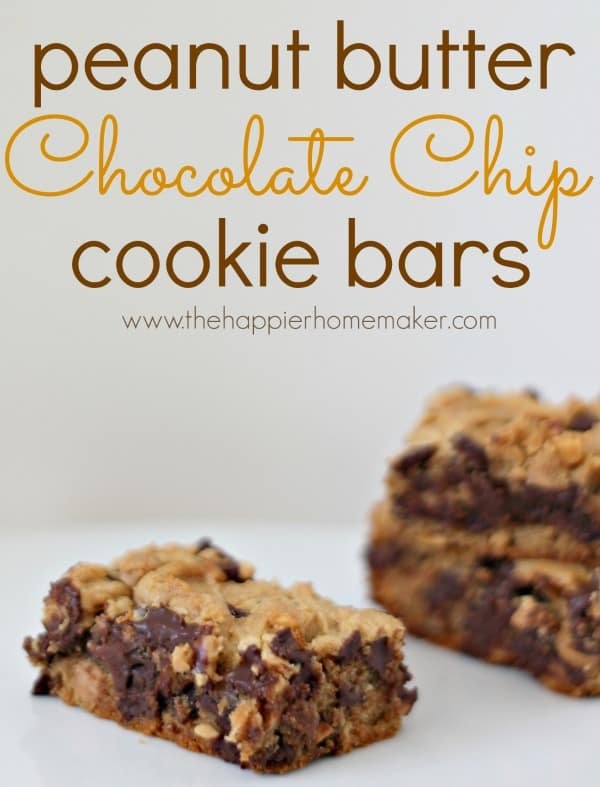 Remove from mixer and mix in chocolate and peanut butter chips by hand. Spread batter in pan and bake 25 to 30 minutes until golden and center is done. Cool on a rack and slice into bars once cool. 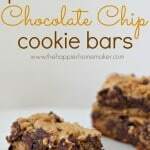 Looks absolutely delicious, will you add this too my link up on Friday for Friday Follow Along Party http://thecraftiestallie.blogspot.com/ ? So, Chocolate and peanut butter are pretty much my favorite combo. Needless to say, I am really glad you posted this. Looks delicious!! Oh my word yum! PB is huge in the house, so I definitely need to make these for my littles. These really are good with a different yummy taste. I used dark brown sugar and butter. Thanks!